Gen Z Skipping School? #infographic ~ Visualistan '+g+"
Why is an entire generation choosing to skip school in favor of entrepreneurship? Gen Z has learned a hard lesson from the Millennials - that they don’t want to be saddled with an average student loan debt of $30k while making considerably less money than their age group did just a generation or two ago. As a result, Gen Z is skipping college in favor of starting their own businesses, but is this a risky move? College grads make more money than high school grads and they have better job prospects. Almost all of the jobs created since the end of the Great Recession require a bachelor's degree. Skipping school can help you save money and it can save you from a lifetime on non bankruptable debt, but you are likely to be in a tougher spot in the long run. 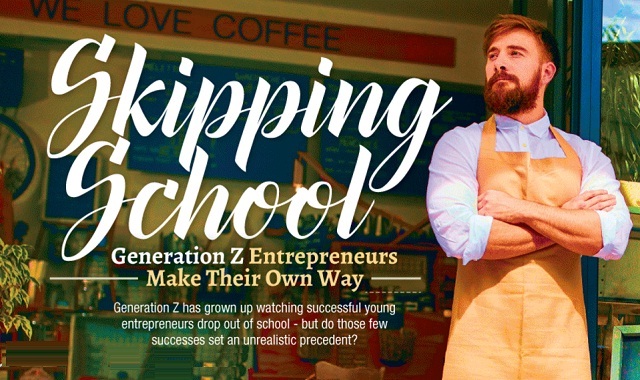 Learn more about why Gen Z is skipping school from this infographic!